Sundays: May 5 and 19, 2019; 1:00-3:00 pm. This introductory class will explore 2-color stranded knitting in the round using Oliver Henry and Sandra Manson's "Roadside Beanie" pattern. 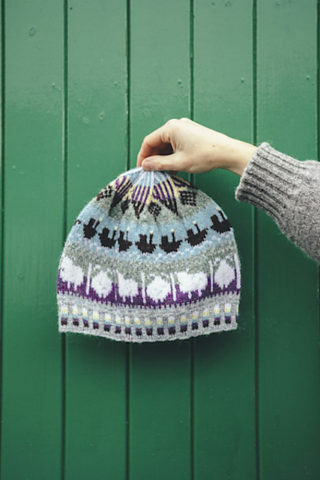 This is the featured pattern for Shetland Wool Week 2019, and is available as a free download for a limited time. Nancy will teach the basics of stranded colorwork, including how to trap floats in the back of the work when using one color for 10-12 stitches in a row. Bring your needles and yarn to the first class - we will cast on and start knitting together. Experience: Students should be comfortable with casting on and knitting in the round. "Roadside Beanie," by Oliver Henry and Sandra Manson, available for download from Ravelry. Jamieson's Shetland Spindrift in 7 colors: Twilight, Grouse, Moss, Dewdrop, Mist, White, and Autumn. We'll have kits available in this colorway soon, or come by to pick 7 colors of your own! 2.5 mm and 3 mm needles for working in the round using the method you prefer; double points, 2 circular needles, Magic Loop, or small circumference circular needle will all work. Materials are all available to purchase here at the shop. Refunds for pre-paid class registrations can be made only if we are notified at least two weeks in advance of the beginning of class. Missed classes will not be made up unless the instructor was unable to teach or the shop was closed for inclement weather. Refunds for missed classes cannot be made.